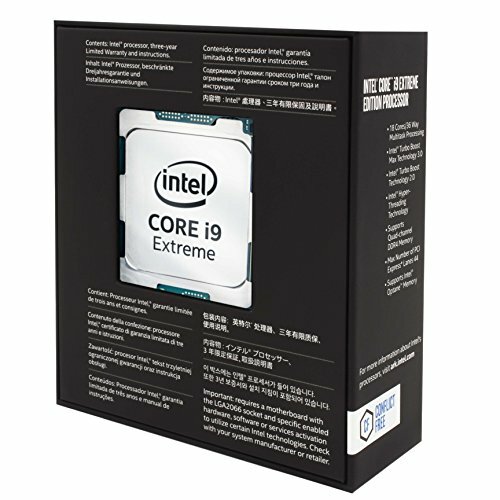 The 2017 CPU war is still raging, with the release of the most powerful and expensive desktop CPU ever – Intel’s 18-core Core i9-7980XE. The Skylake-X range also expanded downwards, with 12,14, and 16-core models stretching up from the Core i9-7900X – the 10-core CPU that launched Intel’s new high-end desktop platform in June. Intel’s new CPUs are quite different from AMD’s Threadripper chips too, with all the cores held in a single die – the Core i9 CPUs demonstrate some stunning engineering on Intel’s part. There’s one issue with this approach, though, which is that it’s expensive, requiring a huge amount of development. Comparatively, whereas AMD essentially combines two Ryzen 8-core dies to create the 16-core Thread ripper 1950X. As a result, the Core i9-7980XE offers two more cores and four more threads than AMD’s flagship, but costs over inc VAT, whereas the 16-core Threadripper 1950X costs under inc VAT. 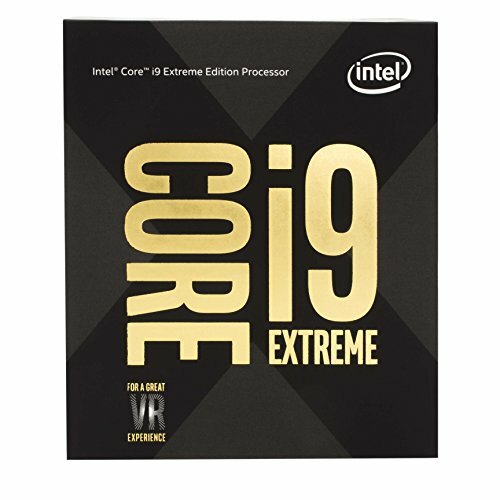 Thankfully, the recent gains in the UK’s exchange rate mean that, while the CPU’s launch price was US, at time of writing, we found it on pre-order this side of the pond for just inc VAT. So while it’s still a wallet-destroying CPU, it’s cheaper than we expected. It’s also undoubtedly going to be quicker than the Thread ripper 1950X in heavily multithreaded software. The Core i9-7980XE’s 18 cores give rise to a massive count of 36 threads courtesy of Hyper-Threading, while the cache restructuring in all Skylake-X CPUs sees it offer 24.75MB of L3 cache, but a sizeable 18MB L2 cache (1MB per core) too. It also supports Turbo Boost MAX 3, which allows two cores to boost up to 4.4GHz, potentially offering some respite from the lowly 2.6GHz base frequency. All cores can boost to 3.4GHz under load, but this clock speed will still hamper the CPU in lightly threaded applications. The TDP of 165W is an indication of just what level of PSU and cooling system you’ll need if you intend to overclock this monster too. With so many cores on a single die, the Core i9-7980XE wasn’t expected to achieve much in terms of overclocking. However, we were astounded when we reached 4.6GHz and found that all but one test was stable. Sadly, we couldn’t apply enough voltage to get stable at 4.6GHz and had to reduce the frequency to 4.5GHz with a vcore of 1.18V, but even so, this clock speed is only 100 MHz lower than the clock speed we managed on the Core i9-7900X, which has eight fewer cores. 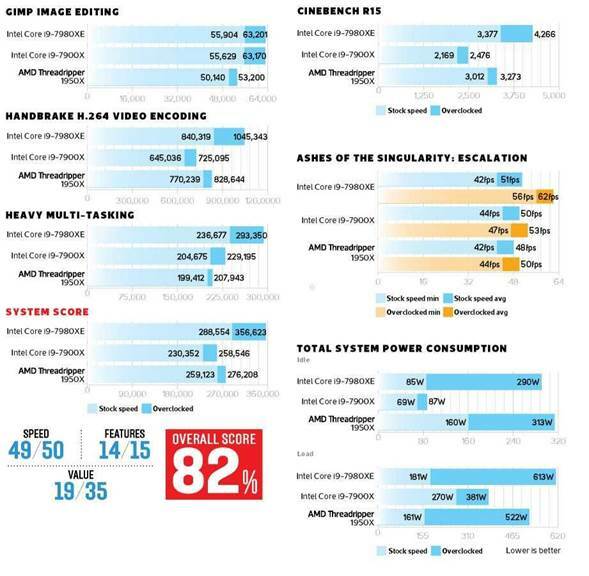 Thanks to some lofty turbo boosting, the stock-speed image editing score of 55,904 was second only to the slightly higher-boosting Core i9-7900X, and only the likes of the Core i7-7700K and Core i7-7740X were able to go higher. The Thread Ripper 1950X wasn’t far behind. It was in the video encoding test that the Core i9-7980XE simply battered every other CPU we’ve tested, bettering the overclocked Thread Ripper 1950X, even at stock speed. The Core i9-7980 X is also the first CPU we’ve tested to achieve a score higher than one million in this test, albeit when overclocked. This result was 26 per cent faster than the Thread Ripper 1950X, although the latter CPU is significantly cheaper. The multi-tasking test was also a win for the 7980 XE, with a 16 per cent advantage over the Core i9-7900X and 19 per cent over the Thread Ripper 1950X, rising to 28 percent and 41 per cent once all the CPUs were overclocked. Again, there wasn’t a huge difference at stock speed between the CPUs overall, with the Thread Ripper just 11 per cent behind. Thread ripper 1950X at stock speed and a massive 30 per cent lead once overclocked. The Intel chip nearly topped the AMD CPU by 1,000 points when overclocked, with a score that nearly doubles that of the Core i9-7900X. Ashes of the Singularity, meanwhile, seems to benefit from both clock frequency and more cores. 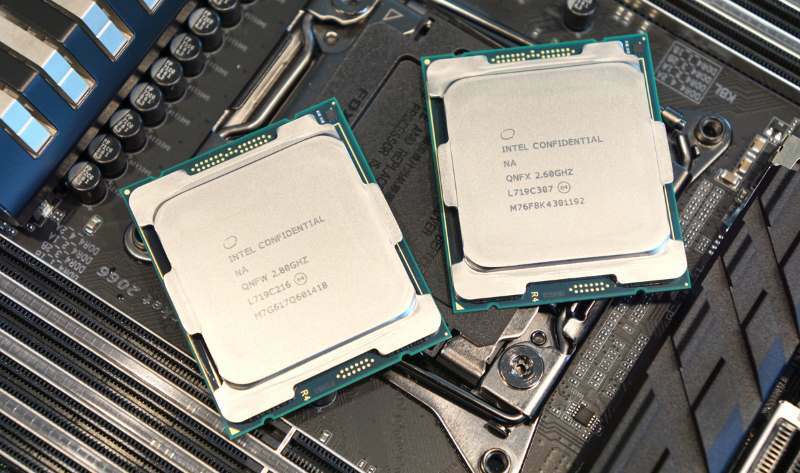 The Core i9-7900X was faster at stock speed, while the Thread Ripper CPU closely matched the 18-core Intel CPU. Once overclocked, though, the Core i9-7980XE was again a monster. The downside to the mammoth overclocked performance, of course, is power consumption, with the system drawing over 600W from the wall, which is getting on for double the power draw of our system with an overclocked Core i9-7900X and nearly 100W more than with the overclocked Thread Ripper 1950X installed. As with Thread Ripper, temperatures were the main issue with overclocking, and custom water cooling as well as delidding the CPU will likely yield much higher results, as Intel is using thermal paste rather than solder between the die and the heat spreader. The Core i9-7980XE is without doubt the fastest CPU we’ve tested, sometimes beating AMD’s flagship by up to 30 per cent, which is more than the core difference would suggest. It’s also quick in lightly threaded tasks, thanks to its substantial boosting frequencies. However, while it could well be worth the cash for some professional content creators, you can’t overlook the vast price tag. You’re clearly getting a CPU that, on a core-for- core basis, is faster than AMD’s Thread Ripper, plus it’s fast all the time in games without having to deal with memory access modes and system reboots. However, it’s still a CPU that most people are unlikely to need or be able to afford. Intel has, though, claimed back its performance crown, and it’s unlikely to be beaten for quite a while. A 4.5GHz overclock across 18 cores is a brilliant achievement for Intel as it reclaims the desktop performance crown, but only if you have an enormous bank account.